The effects of global warming are proving so severe that the gray whale, famous for its annual migrations along the Pacific Coast, could find its way back to the Atlantic Ocean, according to a new study co-authored by scientists at the Graduate Center. The study, "Climate Impacts on Transocean Dispersal and Habitat in Gray Whales from the Pleistocene to 2100," published in Molecular Ecology, uses ancient DNA sequences to show that gray whales migrated between the Atlantic and Pacific Oceans during warmer periods of the late Pleistocene and Holocene ages, when the Bering Strait was open and sea ice was light. Climate change is now causing Arctic sea ice to melt; as a result, whales may move to the Atlantic again. Two recent sightings of gray whales in the Atlantic suggest this movement may already be starting, the study notes. The research was conducted with scientists from Potsdam University, the Wildlife Conservation Society, and partner institutions. "As Arctic sea ice melts, our study suggests gray whales are going to become even more important symbols of the changing oceans," said Elizabeth Alter (GC/York, Biology), lead author of the study. "Today, gray whales are found only in the Pacific. But our research indicates that they may move back into the Atlantic, where they could have transformative impacts on existing ecosystems." 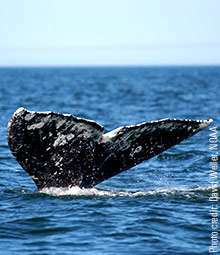 The authors also performed predictive habitat modeling, showing that a gray whale habitat will become increasingly available in the Atlantic in the foreseeable future. "Our results suggest that with ongoing climate warming, the gray whale may sooner or later be back in the Atlantic," said Michael Hofreiter, study co-author and an evolutionary biologist at Potsdam University. Ultimately, recent sightings of the gray whales in the Atlantic may be a harbinger of further change to come, the findings suggest. "Gray whales in the eastern North Pacific have become a conservation success story," said Dr. Howard Rosenbaum, director of the Wildlife Conservation Society's Ocean Giants Program and co-author of the study. "Unfortunately, the complete disappearance of the Atlantic gray whale is the only instance of a whale extinction from an ocean basin during the historical era. Time will tell if the recent few gray whale occurrences in the Atlantic become something more than the sighting of a lifetime." Ah yes, the "horrors" of climate change . . .